In addition to the information provided to the RDA Registry in RIF-CS format, the Registry and Research Data Australia have the following functionality built-in. Data Source Administrators can nominate two primary records that all other records within their data source are automatically linked to. This functionality makes it easier to manage a large number of links to a single object. How it works: This capability is under the control of the contributor and is controlled by configuring the Data Source Account. The administrator can specify up to two primary record keys together with relations. The chosen primary records must be published and from the same data source. All records within the data source will then be linked to those primary (keystone) records and will display as related objects in Research Data Australia.This is an opt-in capability. Research Data Australia can display links in both directions between related objects where the contributors have only provided one half of the relationship and have opted into this facility. This capability is under the control of the contributor and is controlled by configuring the Data Source Account. The default setting is to allow reverse links to be displayed for all related objects within a data source. However, a contributor can opt out of this setting. Example: Budawang Uni creates links from all their collection records to related party records they have also created. Because they have left the Data Source Account setting to its default of allowing inferred reverse internal links, Research Data Australia displays both the collection-to-party links they have created, and also the inferred reverse links from party-to-collection. A contributor can opt in to allow links to be shown from their records to records from a different data source, if that other data source has created a relation to one of the contributor's records. The default setting is not to allow reverse links to external data sources. 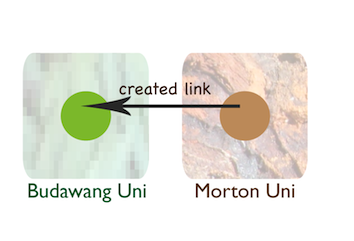 Example: Morton Uni creates links to some of Budawang Uni's records. 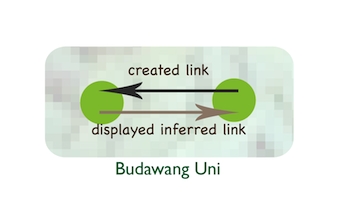 If Budawang Uni has not opted in to allow inferred reverse external links, then no backwards links are shown in Research Data Australia. Research Data Australia users will see links from Morton Uni records pointing to Budawang Uni records, but if they look at the Budawang Uni record, no link back to Morton Uni will be shown. Example: Morton Uni creates relations with some of Budawang Uni's records. 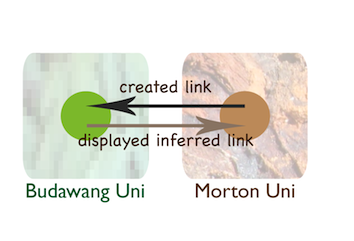 Because Budawang Uni has opted to allow inferred reverse external links, Research Data Australia shows both the links Morton Uni has created, and also the inferred reverse links back from Budawang Uni records to Morton Uni records. The inferred reverse links are created only for display purposes and cannot be edited. You can see them in Research Data Australia, and in the Registry view from Research Data Australia, but not in XML data or manual data entry screens. Where two or more registry objects (from the same or different data sources) share a common identifier, the records will be treated as describing the same thing. In Research Data Australia, these records are merged into a single search result and links to each of the merged records are displayed on the view page of each record. Records from the same contributor are displayed as the primary result when merged. On ingesting a record into the RDA Registry, the system will attempt to identify any other registry objects which share the same identifier. The match is made on both the full Identifier Value (e.g. “1233-3453-3433-6643”) and Identifier Type (e.g. “orcid”). Where one or more matches are discovered, the records are linked for display in Research Data Australia. For party objects, if one or more of the matched records also contain a different identifier which has been linked to other party objects, these matched records will also be considered to be the same party and are linked as well. These five party records describe the same person and are linked by identifier. Research Data Australia users see a visual presentation of a record's relationships through a relationship graph. Each node on the graph provides users with some basic information about the related entity and allows them to easily navigate to a linked page (e.g. ORCID page, RDA page, etc. ), as applicable. If no related entity exists for that record, the graph is hidden from view. Each contributor to Research Data Australia has a Contributor Page, which is automatically linked to all the collections, parties, activities, and services contributed by the organisation (based on the "group" attribute) to the RDA Registry. The Contributor Page is accessed by clicking on the organisation's logo at the top of all records that the organisation has provided. Contributor pages include basic text about the organisation’s content in Research Data Australia, which is automatically generated by the system. This basic information can be embellished by the organisation’s Data Source Administrators (via MyRDA) with richer text, a logo and images if desired. The provision of full URLs is preferable where available, both to facilitate navigation by users and to support linked data developments. XHTML formatting can be provided for text in the Description element and the AddressPart element, to support better display in Research Data Australia. A widget is provided for manual data entry users, or code can be embedded in RIF-CS XML feeds. Note that HTML in feeds must be escaped or harvest errors will occur. The height and width of images provided within the Description and AddressPart elements will be limited to ensure they fit comfortably within the element’s available real estate on the View pages in Research Data Australia. The aspect ratio of images will be retained. Images should be less than 500kb in size.